The obvious choice for me here is The Shining. My friend Nora introduced me to the horror genre when we were wee pre-teens. It was through her that I first saw some classic 70s/80s horror films, including this one. It was, in fact, probably the first horror film I ever saw. Might as well start with the best, right? So much has been studied and written and examined about this film, and with good reason. So this is just me, talking a little bit about the place it occupies in my world. I don’t know about how other people experience horror movies, but when I see one that genuinely freaks me out, I have a vivid sensory memory of the place where I saw it. The first time I saw The Shining, we watched it on VHS in a dim, slightly damp, simply furnished basement room with dark walls and carpet. The television was situated against the front wall of the house, under one or two small ground-level windows. If my memory serves (and sometimes it doesn’t), behind us were an unused fireplace, and a dark, possibly less-finished room. So, there was plenty of scare-space… plenty of area for us to worry about someone or some thing lurking up behind us. When I think of Stanley Kubrick, I can’t help but think of this film first. The strange spaces and sense of disorientation that are hallmarks of a certain segment of the horror genre feel like Kubrick-isms to me. There are those seemingly endless labyrinths of hallways with their oppressive geometric carpeting and sometimes densely patterned floral wallpaper, vast open ballrooms with tremendously high ceilings and bright natural light versus tiny claustrophobic rooms crowded together with small doorways and stairways and incandescent light… And the bathrooms! Two major scenes in this movie take place in two very different, creepy bathrooms. The scene with Delbert Grady and Jack in the red bathroom immediately struck me as just completely bizarre the first time I saw it. They go from a warmly-lit dark-toned bar into a brightly lit and very strangely contemporary, geometrically designed duochromatic bathroom. So weird. Then there’s the tiny bathroom in their little apartment (with its own assortment of strangely mis-matched rooms) where the film’s iconic climax takes place. Wanna feel trapped? That’s a helluva tiny window, and if Shelley Duvall, reedy and toothy as she was, couldn’t fit through it, neither could you. The first time I watched the film, I remember talking with people about how the hotel was messing with Jack (and at times with the other characters). Some of the little tidbits that Kubrick throws in feel designed to mess with the characters and the viewer. When this next image flashed quite unexpectedly on the screen, it freaked the heck out of me. For one thing, what are these two supposed to be doing, exactly? Not only are they clearly out of the past, with those strange probing gazes on their faces, and that disturbing costume, but the man in the tuxedo appears to be sitting on the bed while the other person kneels on the floor and embraces him… Have we stumbled upon some illicit activity? Is this a symbol of how the hotel is f*cking with the Torrances–and how the movie is f*cking with us, the viewers? The Shining is well made. It is a good film, full stop–not just a good horror film. It works on a psychological level, and though there’s some blood, it’s not a slasher flick. The best parts of the movie are the crazy parts and the battle of wits among the possessed hotel, Jack (who’s rapidly losing his), Wendy, and Danny. The hedge maze at the end of the film (which in some ways mirrors the maze-like feel of the hallways within the hotel, the confusion the possessed hotel is imposing), was Kubrick’s idea (the end of the book is different–I won’t spoil it for anyone who hasn’t read it). It’s hard not to love Danny’s cleverness at the end of the film–outsmarting his father and, perhaps, the hotel. There is all sorts of wonderful lore surrounding The Shining, and a nice chunk of it is collected at the IMDB. From there, we learn that Jack Nicholson added a lot to his character. At the film’s climax, he ad-libbed the “little pigs” bit (which to me seems very Nicholson-ish), and it was his (in my opinion, perfect) idea to throw a tennis ball in that cavernous room where Jack Torrance is supposed to be working. When I look at Lloyd the Bartender, I think, “Gee, the way he’s made up, he kind of looks like Harry Dean Stanton, but with bigger eyes and a little shorter.” Funny thing, that. Harry Dean Stanton was originally slated for the role, but had to bow out because he was previously committed to working on Alien. Young Danny Lloyd, who plays Danny Torrance in the film, added the little finger motion when speaking as Tony. It was Danny Lloyd’s first film, and due to its subject matter he was told that it was a drama and was only allowed to see the full, unedited film many years later, when he was 17. 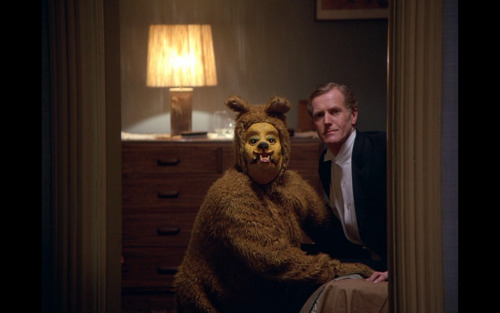 I’ve never seen the documentary Room 237, which examines some of the many ways people have interpreted The Shining, but it’s easy to understand why a small cult has sprouted up around those various interpretations. Kubrick’s film prompted me to read Stephen King’s original novel, and it’s just as good as the movie–if not better. If I’d never read The Shining, I might never have known that it’s possible to be frightened for the duration of the time it takes you to read a book (it does tend to make you read faster!). I also might never have known that Stephen King is a genuinely good writer. I read The Shining in high school, and because I liked it so much I later read The Stand, which I also enjoyed. Dang. I guess I have a lot more to say on the subject of horror movies than I realized. Beyond The Shining, for now I’ll just throw out some honorable mention horror films that I may return to here on The Shy Turnip at some point in the future. I don’t watch a lot of horror, and I haven’t seen many of what are considered to be the classics of the genre, but one I still very much want to see is the original 1973 version of The Wicker Man. I saw Silence of the Lambs at the Rex in Pittsburgh, with Jen (W, the one we saw last week). Also, did you hear about the reissue of the Wicker Man that came out late last year? I can’t bring myself to watch the Shining. The only true horror that I’ve ever seen is The Exorcist & it completely TERRIFIED me. It was on Halloween my freshman year & I had to sleep on the floor of a dorm mate’s room because I had a single & was too afraid to sleep alone! Kim, horror is definitely a taste thing–it’s not for everybody and I’m not that into it myself. I had more interest in it when I was younger, but I’m more sensitive now (and have less time, so I have to be more picky about how I spend it). If you were ever going to watch a truly scary horror film, The Shining would be a good choice. I’ve seen the Exorcist, and it’s not a fave for me (though it is considered a horror classic). I guess if I really believed in the idea of Satan it might scare me more, but I just think the movie is sad and kind of gross. Your reaction to that sounds kind of like my reaction to The Silence of the Lambs. I guess you’ve never seen that? If not, don’t. I think you’d be freaked out by it. You could definitely handle the early spook films I mention at the end of this post, and you might like Mark of the Vampire, which is just kind of funny in parts. It’s not genuinely scary, even for 1935. Ez, I would watch The Wicker Man on video if we can get our hands on it, though a theater is always ideal.